What could be better than getting out with friends, enjoying half priced tickets to sports games, concerts, movies, and so much more? That’s where Goldstar comes in. With Goldstar, enjoy major discount just for filling seats! Goldstar is a growing community of those who enjoy going out and want to go out more. 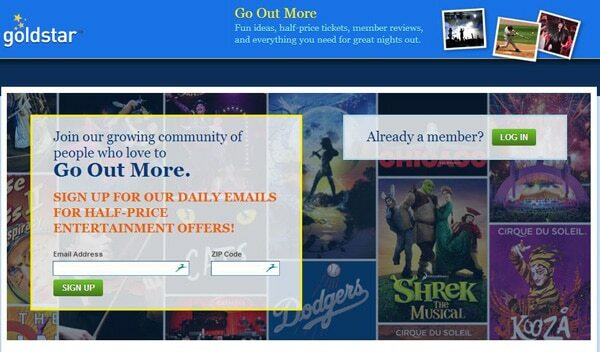 Currently you can sign up to receive daily emails about the current discounts being offered at Goldstar. There’s no catch, all you have to do is signup with a valid email address and zip code and you’re on your way! When you sign up with Goldstar, you’ll not only get discounts to some of the best places in your city, you’ll also find a staff reviews, tips, more than 4,000 venues, user reviews, and tips/tricks on where to eat and park while going out. The team at Goldstar works with many different companies and ventures, including: Staples Center, Madison Square Garden, Cirque du Soleil, Dodger Stadium, Nokia Theater (Times Square), AT&T Park in San Francisco, and the Boston Symphony Hall in Boston among many others. Although the team is continuing to grow, they are currently only available in a handful of major metropolitan areas around the U.S. Cities on the list include Atlanta, Baltimore, Chicago, New York, Orlando, Phoenix, Richmond, San Diego, and D.C. To find out if your city is available, click here and visit the Goldstar website. If you are on the go, download and install the Goldstar Weekend app for iPhone, currently available in the Apple App Store. The iPhone app will show you events close to your area, giving you the ability to read a summary, reviews, and share with friends. Users can also purchase tickets easily through the app. After purchases tickets through Goldstar Weekend, your tickets can be added to your iPhone Passbook®.